My favorite Doctor is David Tennant. 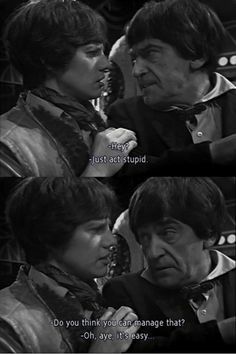 Except when it’s Patrick Troughton. I came to Doctor Who, several years ago now, with the 2005 series and when I guzzled that down in a week (literally watching a season a day) and turned my attention to the rest of the DW universe, I discovered an immense amount of material to sift through. I watched Torchwood, but it wasn’t the same level, and what I saw of Sarah Jane’s spin-off felt more aimed towards kids (which I realize was the point) rather than the all ages appeal I found in Who. And with that I delved into the classic series. Hells bells. It’s more daunting than anything else. Deciding that I wanted to be a responsible little Whovian, I thought I should watch all the episodes in order, from “The Unearthly Child” until the film in the 90’s. In retrospect this was a mistake. I found the format and William Hartnell’s characterization difficult to swallow after consuming what at the time was five and a half seasons of Nu Who. I also didn’t realize how much of the show was missing and balked at the cobbling together that was done for episodes such as Marco Polo. Though they were well put together, I was no longer “watching” Doctor Who. So I decided I’d try a different tack. I chose a full serial of each Doctor, working backwards from 8 to 2. I’d seen a number of the Hartnell’s and while I appreciate his kick-start for the series he was decidedly NOT (one of) my Doctor(s), and would have to be revisited later. Although I would like to note: Barbara…awesome…just…truly wonderful. 8 is a really lovely Doctor, but there’s not a lot of him in the visual medium and he was hampered by a ridiculous movie. I learned to enjoy the camp factor, but the movie is maddeningly over-the-top. I liked 7, but didn’t love him, 6 was hampered by Peri, 5 was hampered by claustrophobic 80’s techno music. I totally got the appeal of 4 and spent a while in the Tom Baker era, watching the Douglas Adams penned episodes and a number of others, including one of my all time favorites “The Pyramids of Mars.” 3 was slightly odd to me; he was an Earthbound Doctor. I was beginning to wonder if maybe the majority of the Classic series just wasn’t for me. But I decided it was only fair to give this last guy a chance. I said I’d watch at least a full serial of each. He’s highly energetic, but can emotionally turn on a dime, which I find incredibly compelling. His size and bedraggled appearance often lead to people underestimating him, lending to a frustratingly arrogant character being puzzled or even bewildered by the end, which is always satisfying. Troughton took the role of the Doctor in such a drastically different direction from Hartnell that the role was changed forever. You see traces of him everywhere. Pertwee’s first episode as the Doctor, he’s essentially doing an impression of Troughton. 2 was offering the Brigadier a Jelly Baby before there was a 4th Doctor. When 5’s regeneration went wrong he reverted to 2. When 6th Doctor, Colin Baker, was being recast, they almost put Troughton back in the role. David Tennant has cited Troughton as the actor that made present day Doctor Who possible and gifted a “Tomb of the Cybermen” DVD to Matt Smith when he was cast. Smith’s 11th Doctor has the closest characterization to 2. But it’s a choice by Smith, as well as Moffat, that is best not to be observed to closely. It has never set well with me. 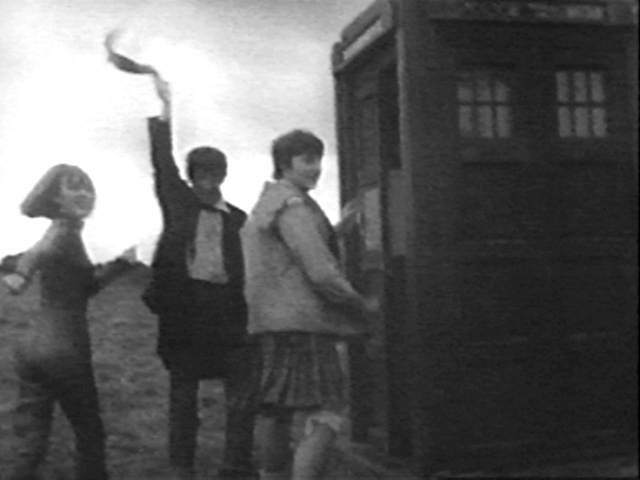 While Troughton’s Doctor was a long long time before the Time War and he was still on the run, his light we’re making it up as we go and it will all turn out alright and who even care because look a what fun we’re having approach to the character made sense. 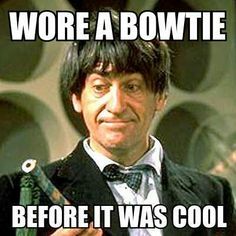 What bothered me was that Smith’s similar portrayal of the Doctor when he was post Time War, was he haf, as far as we knew and indeed as far as he knew until the 50th anniversary, committed double genocide, killing all the Time Lords and Daleks. This makes the Troughton approach in the new context seem nearly sociopathic. He’s often without the shame the 9th and 10th Doctors had. Of course, the argument can always be made that 11 was healing with time or running from and trying to forget the past. And alternately, Troughton’s Doctor was not above the occasional murder. Unfortunately for the 2nd Doctor, the Time Lords did consider him guilty of stealing a TARDIS (fair dues) and interfering in the course of historical events (…okay, yeah), which apparently breaks some sort of Time Lord law. He was caught by the Time Lords and forced to regenerate as well as exiled to Earth. One of the most painful side effects of this sentence was the loss of the Doctor’s final two companions, Jamie and Zoe, who happen to make up my favorite 2nd Doctor companion combination. 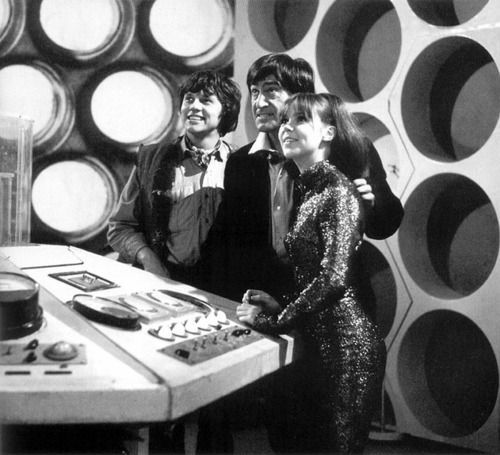 Jamie was with Troughton’s Doctor from nearly the very beginning, joining the show in the second Troughton serial and Zoe was possibly the cleverest female companion they’d had up to that point. Despite the Doctor’s overt favoritism of Jamie, he also seemed to trust that Zoe could take care of herself when faced with a real danger. I adore Jamie, but he definitely needed an eye kept on him, and no one ever accused him of being clever. Of course this contrast of character is what made them such a sublime trio. To this day Jamie has been in more Doctor Who episodes than any other companion. Which is why he and Zoe getting their memories erased is so fucked. I hate when they do this. My favorite Nu Who companion, Donna, had the same fate and I almost would prefer they kill the characters off. The idea of the brain of a Doctor’s companion being tampered and warped goes against everything the Doctor fights for. And I’m crying just as hard anyway…. All that I’m trying to say is that there is a joy that exudes from Troughton whenever he’s in that role and we owe his 3 years in the TARDIS the 46 years of Doctor Who that we’ve had since he fell out of the TARDIS. And that’s why I’m crossplaying as the 2nd Doctor at Gallifrey One 2015. This entry was posted in tv and tagged 2, ben, classic who, doctor who, jamie, patrick troughton, polly, second doctor, tardis, the doctor, victoria, zoe. Bookmark the permalink.